He is considered a future promise of Spanish Cycling. He is from Gijon, he is only 23 years old and is part of the Bahrain Merida Pro Cycling Team, which we have welcomed at Cambrils Park Sport Village during their pre-season training session. Iván García Cortina transmits illusion, kindness and willingness to conquer the world on a bike. He is passionate about classic races and the epic in riding over the mythic and dreaded pave, which he is really good at. Will he attain his dream this season? You joined the Bahrain Merida when you were 21 years old, now you are 23 and you are still one of the youngest in the team. How do you cope with it? How do you get along with more veteran cyclist? Being so young and spending time with older people and more experienced, like Vincenzo Nibali, you gain experience and learn from them. On the one hand, is a great advantage. Any prank or joke from the veterans? The first year I did. I got my hair shaved off. I got it longer than I have it now and they crew-cut it. But this has been all - he smiles, equally enjoying it and resigned-. Have you sacrificed a lot of your personal life to become a professional cyclist? To sacrifice, few. Because, as it is something that I like a lot, I don’t feel like I miss that much of “life”, sort to say. What I like the most is this, to look after myself, train, ride the bike, go to new places, travel….I have had it all at the age of 23, so, to sacrifice, nothing. I love it. Who has been your model in Cycling? I have had a lot. When I started 10 years ago, it was Lance Armstrong. As my neighbour Chechu Rubiera was his favourite domestique, I was always paying more attention to him. Later, over the years, I started to like classic races more and Tom Boonen or Fabian Cancellara were my main models. And how do you feel about having as teammates cyclists like Purito, Haussler or Vincenzo Nibali who, maybe, you admired before leaping to the highest level of the competitive sport? 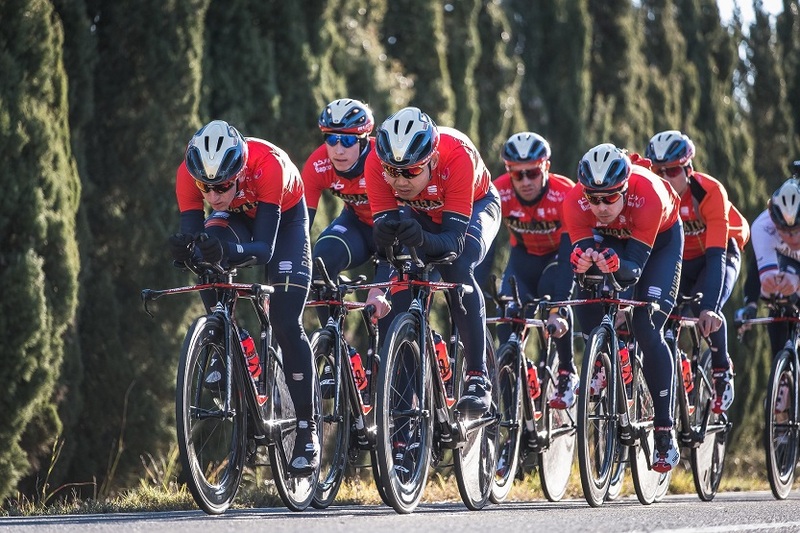 The first year I got here, I didn’t know any of them personally and to share with Vincenzo Nibali, with Purito or Haussler, to be honest, was amazing. Because, you see the difference, but, in the end, they are like you, they are normal people. Besides, I am pleased to work for them, like last year and the previous one at La Vuelta with Vincenzo or with Haussler at the classic. It is just wonderful. Yes, for example, last year at La Vuelta. At the stages where I had to work for him, to take a big lead off in the mountain passes and other things, I did it. But then, when stages were flatter or more to sprint he would give me the opportunity and that is something to thank for. The fact that they give someone young like me, first or second year, an opportunity to sprint in such an important race for the team like La Vuelta, …..not all teams do so. You are considered a future promise of Spanish Cycling, one of the riders with more projection. Do these expectations make you feel more pressure? Pressure no, because the first one who wants everything to work is me, to be visible and win races. I’m the first one who wants to win, who wants to be at the front, that wants to do it well. And for this reason, it doesn’t make me feel any pressure. If there is something I can’t do it's because I can’t, but I give my 100% effort to get it. You renewed with Bahrain Merida for the current season and for 2020 one. How do you feel in the team? What is Bahrain bringing to your career? It is a team that, to learn, is great. I have opportunities in almost every race, to let myself be seen or to sprint…I always play an important role in every team’s race and I appreciate it. Having renewed for 2 years means to be calmer. Now I have 2 more years to progress, to go little by little and keep growing within the team. In classic races I have a really good calendar this year and, honestly, I am feeling really well. And, how do you think you contribute to the team? We have read Brent’s Copeland, the team’s manager, statement saying: “Iván is a good teammate, he is always in a good mood and optimistic, he always has a smile on his face. Iván always brings good vibes to the team”. I don’t know. I enjoy cycling and it is pointless to be mad…. You should be like that at the races, so, it is always better to take it with humour. Purito is the team’s ambassador and one of his main roles is to be a mentor to the youngest ones, meaning, you and other teammates. Does it help you to have it as a model or adviser? In my case, it even helps me more as I live now in Andorra and I have it with me. He always helps me. Then in the team the same, he is always talking with us, mainly he gives us advice. When we start and are young, we think that we know everything and most of the times we don’t have a clue. Those are the things that you value the most and that are much appreciated. If it comes from someone else…but if it is someone who won so many races and won so many places on podiums who says it, it must be for a reason. Most cyclists dream of winning the Tour of France, but you, on the contrary, dream of being the first at the classic races in Paris – Roubaix and the Tour of Flanders, which any Spanish has done it before. What do classics have that you are so passionate about? I hope. Classic races are the ones that I like the most and winning them would be a dream. The classics were what hooked me on cycling. I would always watch Flecha and got hooked. I love them, they are one-day races, but they are hard and more epic. They are long races, 6 or 7 hours long and most of the times with bad weather….it has its charm. They are almost flat, it is not that they have a lot of mountain passes, but the pain on your legs is huge – he laughs-. In what races will you take part in this season? I will start with La Vuelta in Valencia, then I will do la Vuelta Andalucía, a couple of classic races in Belgium, Paris – Nice…. And later, the rest of the classics in the north, the Tour of Flanders, Paris Roubaix… Even, this year, the Amstel Gold Race! Later, the Tour of California…. In total, they are more or less 75 or 80 days of competition. What would you highlight from Costa Daurada’s routes and roads? What are you enjoying the most about training here? Costa Daurada’s roads are really good. I knew a little bit about them because my partner has an apartment in Mont Roig, and when the weather is not nice at home, we come here. Here, whether it is hot or cold, the weather is quite nice. There is no traffic, there are loads of inland roads that are incredible, a lot of climbs…It is a good place to train. Besides, we are quiet, the Resort is very nice because each one has his own en suite bathroom…. And we aren’t used to it. Normally we are at hotels were the suitcase barely fits in. In general, I like this training session a lot, and, on top, at home. Maybe that is the reason. Do you think that our roads are safe? Security in Spain is not that bad, we can’t complain. They would normally leave the security distance and roads are really good... Most places in Spain are good for cyclists. Nevertheless, if you go to other places like Italy, for example, they graze you when overtaking, literally grazing and honking! Obviously, the first time, to me, wasn’t normal, however, Italians would not be troubled because they were used to. Then, when they come here, they are amazed to train because there’s a lot of respect towards cyclists. There are always accidents, but compared to other places in the world, we are better here!